The 9-3167A is a 4x cam sensor design that fits LS7 & LS9 dry sump engines with three bolt cam sprockets. An industry breakthrough when introduced in 1992. 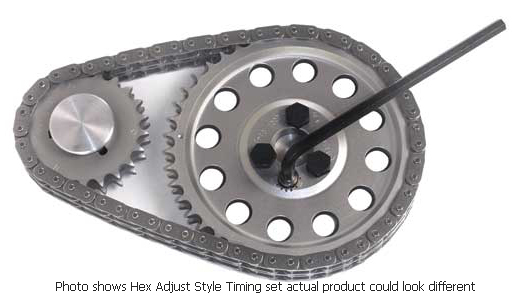 Since then the accuracy and simplicity of our Hex-A-Just� system remains unmatched by competitors. The Hex-A-Just� True� Roller Set is infinitely adjustable to /- 6 degrees. No machining required and no fumbling with offset bushings. Simply dial in your cam timing with the turn of a wrench then tighten the cam bolts to lock the cam position in place. Sprockets are machined from premium billet steel on our state-of-the-art CNC equipment. Both sprockets are then induction hardened and oil-quenched using our in-house multi-stage heat treat process. Our Premium True� Roller chain features superior strength with full roller action. Side plates are cut and shaved from high strength steel and heat-treated for maximum fatigue resistance. The .250� rollers are �cold rolled� and hardened to exacting standards increasing load and RPM capabilities. An additional feature on Chevrolet applications is the Cloyes� patented �cheater� sprocket tooth profile that provides improved chain wrap and smoother transition.